6 months ago today was the last day I would spend with the love of my life, Maureen, alive. I came to the only place that seemed appropriate to write, “To Catch a Falling Star.” I am sitting at Teo’s Gelato and Espresso across from Seton Hospital on 38th street. I am looking up at the room on 7 North, the room that 6 months ago tomorrow I was looking down from as the day dawned. I looked out over the Hill Country and saw stars twinkling as dawn was arriving and looked down and saw Teo’s. 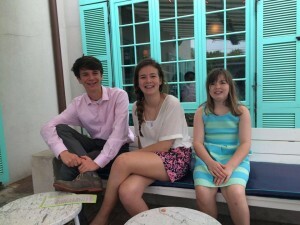 Teo’s, the place where Maureen and I brought our 3 kids for gelato frequently after school. It has always been a special place. Now, it is sacred space. 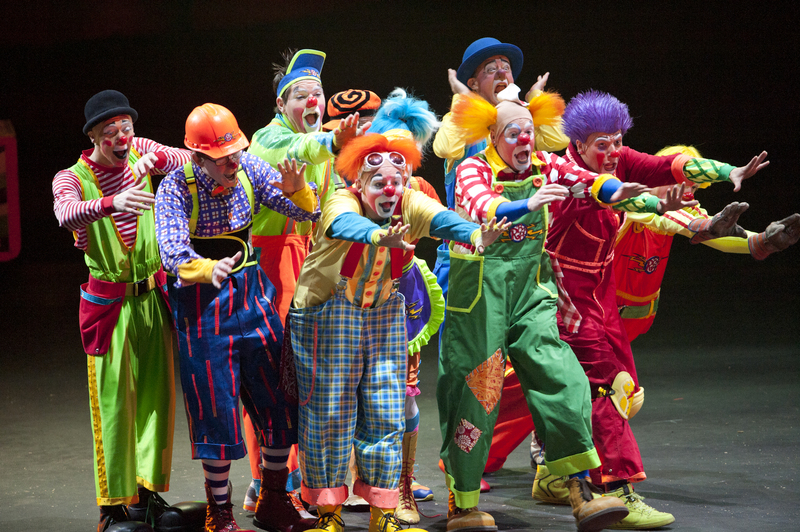 With the title, “To Catch a Falling Star,” you might not expect me to talk about clowns and the circus, however, that is exactly what is to follow. Its connection to catching falling stars will become apparent and explicit at the end. Like so much of what I write, this one has been bouncing around in my head and my heart for months. 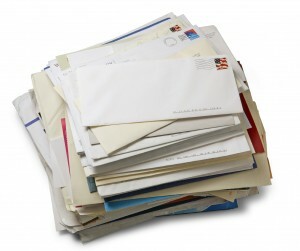 Today, though, is the one where it will flow out, though my fingers, and into this latest post in the Love Of My Life. As I said in a voicemail I recently left for my sweetie, my Maureen, my love has only deepened and strengthened since her passing. I miss her terribly, but every time I think about her, every time I write about our love, I realize how blessed I was and am to have spent more than half my life with this truly incredible woman. So, you might be thinking, how exactly does the circus fit into all of this. 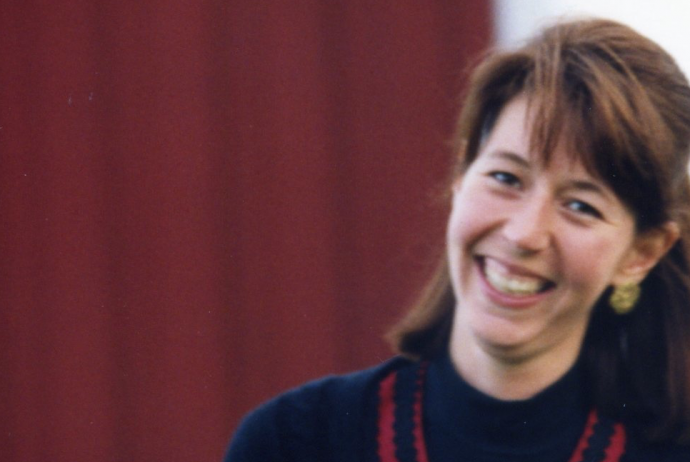 Well, after Maureen and I were married on July 14, 1990, we were eagerly awaiting our honeymoon to Denmark and Norway (I will write more about that journey in the future.). Before we embarked for that epic trip to Scandinavia, we decided to have a few days to ourselves to relax from the joy of our wedding and the celebration with our family and friends. We decided on a lovely B&B in Delavan, Wisconsin. 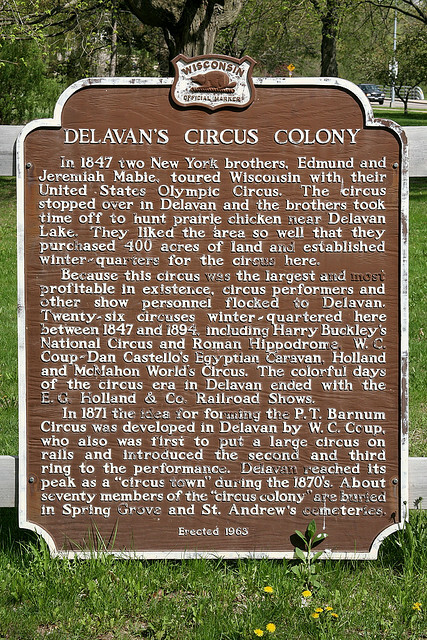 It was spectacular, and we learned from the innkeepers at the time that Delavan, not Baraboo, was the actual historical home of the circus in Wisconsin. 24 years before Ringling Brothers raised its tent in Baraboo, Wisconsin, the U.S. Olympic Circus was raising its tent in Delavan. Delavan is in the beautiful Lake Geneva area of Wisconsin, and it was the perfect spot to rest and enjoy our first days of marriage. I’ve frequently joked with Maureen that like the clowns in the circus, I’m simply here for comic relief. During the 11 years of her on and off battle with breast cancer, there were many moments where being a clown is all I knew how to do. One of the things that is fascinating about the circus I learned many years into my career in sales and marketing (as you may recall, Maureen and I met at Apple, where I was in sales). In sales, you frequently hear the slang term, have you made your nut? This is slang for have you made quota? 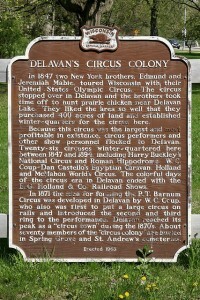 Years after our trip to Delavan, Wisconsin, I was listening to NPR and heard a story about the circus. It caught my attention, and as I listened, I learned about the nut. Apparently, in the old days when the circus rolled in to town on a train, the head of the circus would hand the mayor the “nut.” The nut was the item that linked the engine of the locomotive to all the other circus cars. The head of the circus would then make a promise to the mayor about revenues to be raised while the circus was in town. 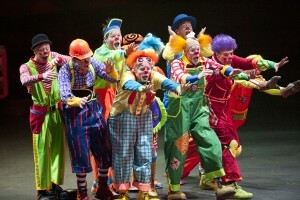 Only when that commitment was made could the circus leave town. In order to connect the circus cars back to the locomotive, they would have to “make their nut.” I love trivia like this, and I loved the fact that it connected back to the circus and to the town in Wisconsin where Maureen and I started our honeymoon. Maureen and I crossed paths with the circus again last September as we were driving a “triangle” from Austin to Houston to Dallas and back to Austin. 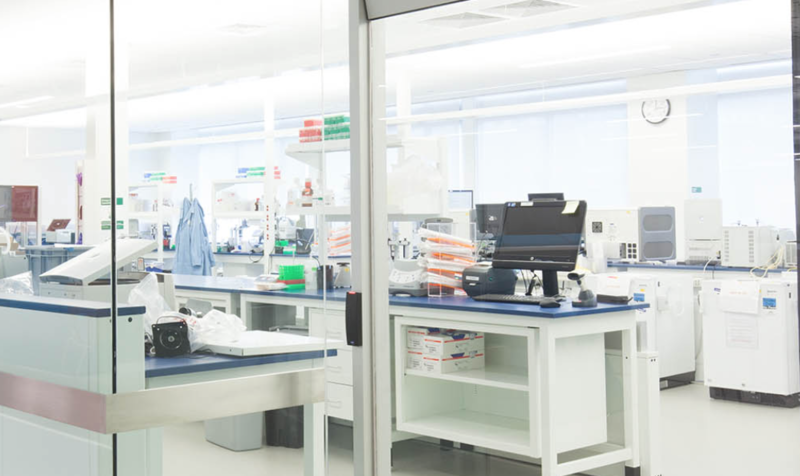 We had headed over to MD Anderson Cancer Center in Houston to get some ideas on next steps in treatment and from there headed up to Dallas to Texas Oncology at the Sammons Cancer Center. On our way up 45 from Houston to Dallas, we stopped in Corsicana for a bite for lunch. 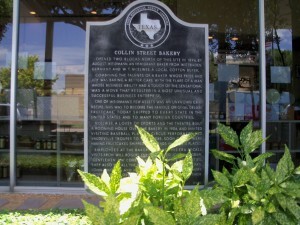 We went to the Collin Street Bakery. I still remember sitting across from Maureen, both of us eating a chicken salad sandwich on their amazing pecan bread. 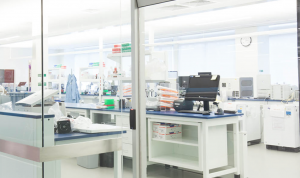 Obviously, this was a heavy trip, knowing that the metastasizing breast cancer needed new answers and new treatments. However, as I said before, comic relief was my natural suit, and for those that know Maureen, watching her laugh was as joyous and beautiful as watching her smile. As we read about the history of the Collin Street Bakery, we reflected on the start of our honeymoon years earlier back in Wisconsin. Apparently, the Collin Street Bakery and its fruitcakes had achieved worldwide fame because John Ringling and his circus had stayed in the hotel where the bakery was once housed. They so loved the fruitcakes that they began sending them as gifts to friends around the world. We not only brought some pecan bread home to the kids but also shared the stories of Delavan, Wisconsin. If there was any biological way to have taken Maureen’s cancer cells and to insert them into my body, I would have done it. She was my star; I wanted to be her clown. Instead, she was mine. And, there is no doubt in my mind that God had decided she had made her “nut,” and He was ready for her circus train to return to heaven 6 months ago. Sweetie, I miss you, but I will make sure that I make my “nut,” along with the kids. Save me a spot in your ring in heaven, so that I can be your clown once again. Night is falling on Easter Day 2015. It has been an emotionally powerful Holy Week, staring last Sunday as we committed Maureen’s ashes on Palm Sunday. Then, the following day I celebrated my 50th birthday. I spent the day reflecting at the Lake Austin Spa Resort. The last time I was at the Lake Austin Spa was with Maureen, so it was both a refreshing day and a thoughtful one. On Monday, as I enjoyed a facial, lunch, reading by the pool and a massage, I decided that I was no longer going to use the word, bittersweet. For more than half of my life, I was with the love of my life, Maureen. Every day was sweet, and although I would love to continue to enjoy every one of my days with my beautiful bride, there is nothing bitter about love. I am certainly sad that she is no longer with me physically, but I am not bitter. I’m still in love. As we traversed Holy Week, love, obviously came up frequently, as our feet were washed on Maundy Thursday; as Christ celebrated the last supper with his disciples; love was even on display in His death on the cross; and then today, the power of love washed over all of us as we celebrated His resurrection. You can see the impact of love in all of the wonderful Facebook pictures of friends and family having fun together, loving one another. Whether celebrating Passover or Easter, every one of us is celebrating love, and it shows. It is beautiful, and it is powerful. Love is the ultimate act of religious freedom. The gospel reading at our Maundy Thursday service was from the gospel of John, and it has really stuck with me. It is from chapter 13. It is verses 34 and 35: “A new command I give you: Love one another. As I have loved you, so you must love one another. By this everyone will know that you are my disciples, if you love one another.” At this point, you may be asking, what in the world does any of this have to do with heaven being pink? Well, for one day, heaven was pink. It was two days after Maureen had passed away last October. Before continuing, full disclosure is important. Maureen really didn’t like pink. It was the color of breast cancer. For those that have been reading the love of my life for a while, they know Maureen never allowed cancer to define her life. 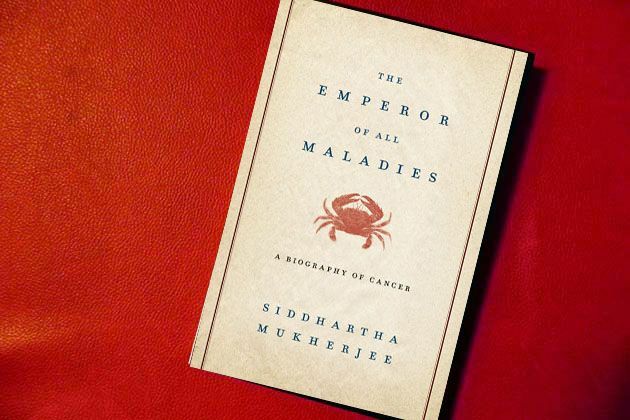 Her dignity during the 11 years that this “Emperor of All Maladies” was present in her body and our lives inspires the kids and I to this day. She exemplified love no matter how hard it got, however, for this one day last fall, pink was the color of love, not of breast cancer. This beautifully epic day will forever be etched in my memory, Kyla’s memory, our family’s memory, and the memory of all who were present for the volleyball game between the girls 5A teams of St. Andrew’s Episcopal School and St. Gabriel’s Catholic School. I have been waiting to tell this particular story for over 5 months, never knowing when the right day would come to tell it in its entirety. I knew Easter would be the right day, but it wasn’t until Fr. Mike Adams’ sermon this morning at our church at All Saint’s Episcopal Church that I knew exactly why. Fr. Mike started by talking about sacraments. Sacraments are an outward and visible sign of an inward feeling. The powdered donuts we all enjoy on the 21st of each month, the day of Maureen’s passing last October, are a sacrament. The tea I still make Maureen every morning and her lunches on weekdays are sacraments. They are an outward and visible sign of the love I and we all feel for this daughter of God, my beautiful bride of over 24 years. However, Fr. Mike continued with this statement about sacraments. Sacraments “allow us to say more than we can with just words and by participating in it, we are empowered to bring about in our daily lives what we symbolized in the sacrament. We play the kingdom of God, which is to say we play life.” On Thursday, October 23, the girls 5A volleyball teams played more than a game. If you were in the gym at St. Gabriel’s, you quickly realized that what was evolving out on the court was a sacrament. It was an outward and visible sign of the immense power of love. To set the scene, it is important to note that both St. Andrew’s and St. Gabriel’s were tied in the standings at this point in the season. It is also important to note that both teams were really good; there were some excellent young ladies on both sides of the net. Thursday night of the game was only 2 days after Maureen’s passing. We were in the midst of preparations for Maureen’s funeral on Saturday; family from around the world were arriving in Austin; friends were rallying to support us; and quite frankly, we were still in shock. Against this backdrop, we arrived for this away game at St. Gabriel’s, about to bear witness to more than just an amazing game. We were about to bear witness to heaven on earth. Everything changed that night. Emotions went from numbness to joy, but not the joy that comes from winning a game, but the joy that comes from the power of love. The gym was a sea of pink. 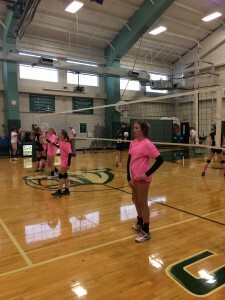 Each of the girls on Kyla’s team were in pink volleyball shorts, and each had a pink practice shirt on over their game shirts. These girls and their amazing parents in less than a day had come together out of love for Maureen and our family to put these wheels in motion. It was a deeply emotional and moving sight. Like I said, for this night, pink was the color of love, not of breast cancer. As the next few minutes unfolded, it was clear that this was not going to be a home game for St. Gabriel’s. It was instead going to be a home game for love. The varsity girls volleyball team from St. Andrew’s Upper School took the night off from their practice to come and support the middle schoolers, and almost every one of Kyla’s fellow 7th graders and their families were there, too. My heart was full. I know Maureen’s mom and dad were deeply moved (as were her whole family), moved by the love for their little girl, Maureen, and their granddaughter, Kyla. 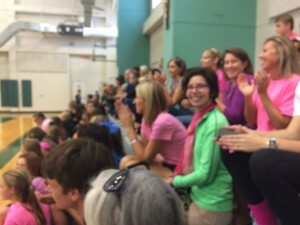 Even before the game started, this volleyball game, this sacrament “allowed us to say more than we can with just words.” The game itself was as amazing as the outpouring of support. As I said, there was incredible talent on both sides of the net. Each of these ladies is a terrific player. St. Gabe’s is a strong competitor, and they fought each and every point. However, there was something different in each and every get, set, spike and serve on the St. Andrew’s side of the net that night. That night, it was not about volleyball. It was about love. You could see the love as balls were chased one step further; you could see the love as these ladies in pink went up together for a block; you could see the love as the digs went deeper, the sets went higher, the spikes went faster. Before the game started, I had told Kyla that she didn’t need to win this game to honor her mommy, our Maureen. I told her to tell her teammates not only thank you but to have fun. That said, you could tell something was different that night, for Kyla and for her teammates. The game was a see-saw affair. The first set went to St. Gabe’s 25-22, and the second set went to St. Andrew’s with the same score in reverse, 25-22. This brought the match down to the final game, game three. I could tell my Kyla was inspired, as she leaped higher to get shots, and as she served more forcefully, with the force of love in the beautiful swing of her right arm. However, in this game, as with life itself, it is what we do together that makes all the difference. Every successful point in volleyball usually takes all three hits you are allowed on each side of the net, and on that night, each of Kyla’s teammates made sure that all three hits meant something. And, they will forever mean something. Kyla will be able to tell this story to her children one day, the story of the night that heaven was pink for one day. 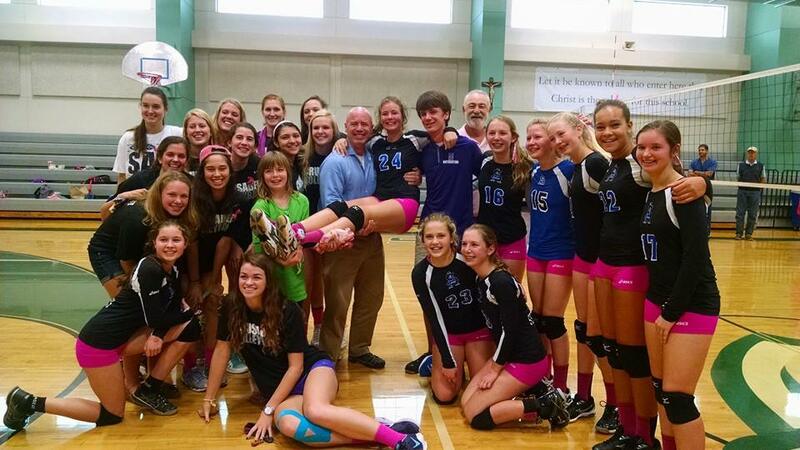 For, as game three unfolded, these special teammates on the 5A St. Andrew’s Episcopal School girls volleyball team never jumped higher than they did than when they won the game 15-10. The joy that erupted was amazing. The love that was on display was moving. I think St. Gabe’s realized that no one had lost that night. We had all won, because love had won. Love had won, just like love won today with the resurrection of Christ we celebrate on Easter Day. Everything shifted for our family that night because of the love of these girls. This game said more than we could in words. It was a sacrament. We went from planning a funeral to planning a celebration of life. And that quite frankly is the whole point of Easter. No one loses to death when we are held in the embrace of love and the embrace of Jesus’ resurrection. Heaven was pink for one day.